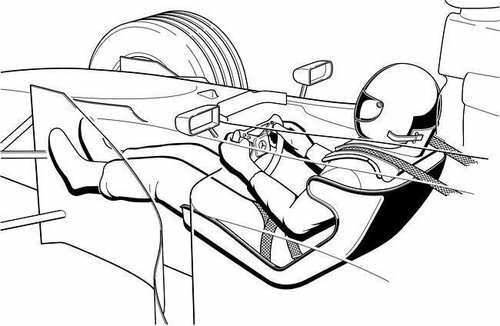 |Technique| A driver’s body is more connected than you think. Until recently, it was assumed that the body operated as a mechanical model where it was assumed that forces were localized to individual parts of the body. So for example, when gripping a steering wheel it could be assumed that the force would (mostly) transmit through your hands, forearms and upper arms to eventually stop at the neck and shoulders. However, myofascial research (muscles and their surrounding fascia or connective tissue layers) is now painting a different picture. The research has found that the current model is incomplete and that the body actually functions as a tensegrity based system, where instead of the body being individual parts that sum up a whole, everything is connected. Under tensegrity model, forces are distributed throughout the whole system and cannot be localized to one body part. What that means is when you’re gripping the wheel with your hands, you are no longer isolating forces in the arms. Under the tensegrity model, gripping the wheel means that while the force is transmitted through the hands, arms and shoulders, it can also be transmitted through the face, the spine and even the lower extremities depending on the position of the body. Try to grip an object has hard as you can, for as long as you can. Notice how you’re entire body starts to feel exhausted, the longer you try and hold it? The same concept applies in the race car. A relaxed grip on the steering wheel becomes ever more important. Overstressing your grip on the wheel doesn’t just wear out your hands. It can wear your entire body out. A more relaxed grip will allow you to get more sensitivity from the car, and get the maximum performance over the race distance for longer. Editor’s Note: I want to thank Nikki-Naab Levy to ask for some information on how the physical body system works and more assistance collaborating on this post. This entry was posted in Technique and tagged Endurance, Grip, relaxed, steering. Bookmark the permalink.